This year’s SXSW Interactive conference – an annual event that brings together leaders in technology, media and music – will have two new high-profile speakers: the president and first lady. Barack and Michelle Obama will be speaking during a period of intense focus on the tech industry, with Apple CEO Tim Cook’s open letter challenging the FBI’s request to aid in unlocking a terror suspect’s iPhone, Twitter announcing an online safety panel and more companies getting into the “cord-cutting” business. In a Pew Research Center survey conducted in February on the issue of whether Apple should assist the FBI in unlocking the iPhone of one of the San Bernardino terror suspects, more Americans sided with the government than with Apple. Some 51% of U.S. adults said Apple should assist in unlocking the phone, while 38% said the company should not help unlock the phone because it jeopardizes other users’ security and privacy. Americans’ views about the trade-off between security and personal privacy have shifted over time and public opinion is often influenced by major news events. 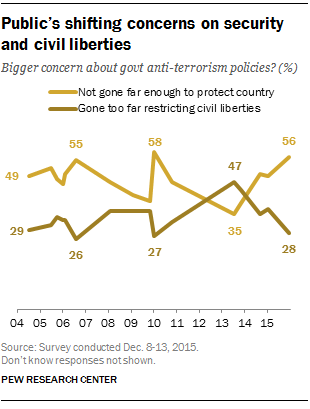 Following the San Bernardino and Paris attacks, 56% of Americans said they were more concerned that counterterrorism efforts had not gone far enough to protect the country, while just 28% said they were concerned that efforts have gone too far in restricting civil liberties. By contrast, after the Edward Snowden leaks in 2013, concerns over civil liberties were more prevalent than concerns for national security. Americans are anxious about the privacy environment. The vast majority of Americans – 91% – agree that “consumers have lost control of how personal information is collected and used by companies,” including 45% who strongly agree with this statement. The public also has little confidence that companies and organizations can keep their personal data secure. Lawmakers, advocates and tech professionals have been looking into ways to curtail online harassment in the wake of high profile cases concerning cyber-bullying and online threats. 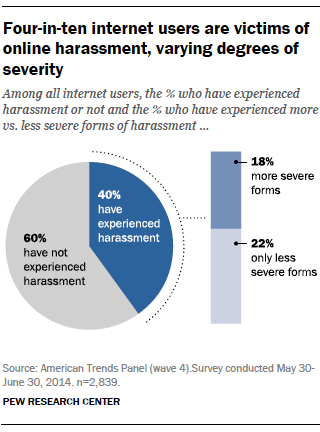 A 2014 Pew Research Center report found that online harassment was fairly common among internet users: 40% of online adults have experienced some form of online harassment, and that share jumps to 65% for those ages 18-29. Smartphone adoption has grown rapidly in the U.S. Today, 68% of U.S. adults own smartphones, up from 35% in 2011. Beyond calls and texts, smartphone owners use their devices to accomplish a number of tasks – including getting directions, applying for jobs and getting health information. For some Americans, particularly younger adults, minorities and lower-income Americans, smartphones are their gateway to the internet, and this “smartphone-only population” is on the rise. Today, 13% of U.S. adults have smartphones but do not have home broadband service, up from 8% in 2013. Smartphone ownership, however, is still less prevalent among lower-income Americans. The persistent debates about “digital divides” took another turn this week when the Federal Communications Commission circulated a final proposal for creating a government subsidy of $9.25 a month to encourage low-income households to gain broadband connections. Mobile technology has not only changed the way people get to where they need to go, but it has also ushered in a new wave of businesses and sparked debates about how to regulate companies that provide services that can be called up on an apps. Ride-hailing is one of the most well-documented examples of growth in this so-called gig economy. A 2014 Pew Research Center survey found that 11% of smartphone owners use their phones at least occasionally to reserve a taxi or car service. It is most popular among smartphone owners ages 18-29; 17% of them have reserved rides via their phones. In addition to car services, the gig economy has spawned businesses ranging from home sharing to online marketplaces for homemade goods. Some Americans are ditching their cable TV services as content such as news, sports and entertainment has become increasingly accessible online. This potential shift in the media landscape could have far-reaching implications for many industries. Our 2015 report found that 15% of U.S. adults are “cord cutters” – meaning they once subscribed to a cable or satellite TV service but no longer do so. Additionally, 9% of Americans say they have never had cable or satellite TV. These findings suggest that how people – especially young adults – get and consume content is changing. While Pew Research Center does not have specific data on staff diversity in the technology industry, U.S. Census data show that blacks, Hispanics and women are often underrepresented in the fields of science, technology, engineering and mathematics. For example, blacks and Hispanics combined made up 26% of the total U.S. workforce in 2011, but their share of STEM occupations was only 13%. Self-reported data from several leading technology companies echo these disparities. Indeed, a recent Pew Research Center report shows that while a growing share of people living in emerging and developing nations surveyed use the internet, there are still wide differences in internet use based on income, education and age. Moreover, people living in richer nations are more likely than those living in poorer, developing countries to have access to the internet or smartphones. Experts have also expressed concern about the “Balkanization” of the open internet as countries like Iran and China crack down on dissidents. Overall, our data suggest there is substantial global support for principles of free expression online, but people also support limitations on some forms of speech – both online and offline.